We know how to do a beach day. I mean, we live at the beach, but what do you do when you’re in a beach destination without kids? 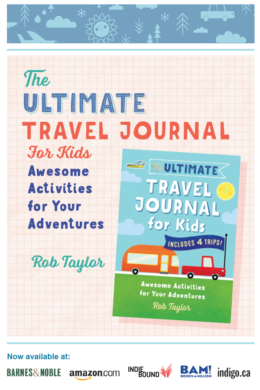 And what if it’s a beach destination that also has non-beach stuff that is pulling you away from the surf? Playa del Carmen is just that. Here’s how to plan an amazing trip to Playa del Carmen and do more than the beach. 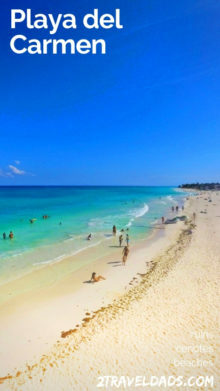 If you’re unfamiliar, Playa del Carmen is on Mexico’s east coast, on the Caribbean, and part of the Yucatan Peninsula. It’s very different from the west coast or Baja California. 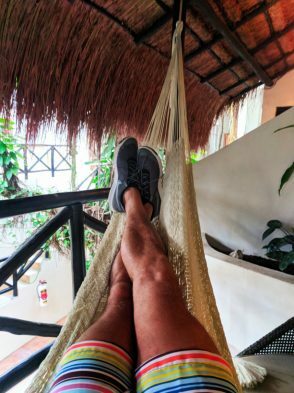 Playa del Carmen still has the huge hotels (and it’s close to Cancun, so yeah), but it’s also very chill. 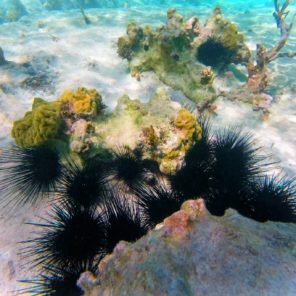 It is an awesome Caribbean destination for getting close to nature AND having beach fun. 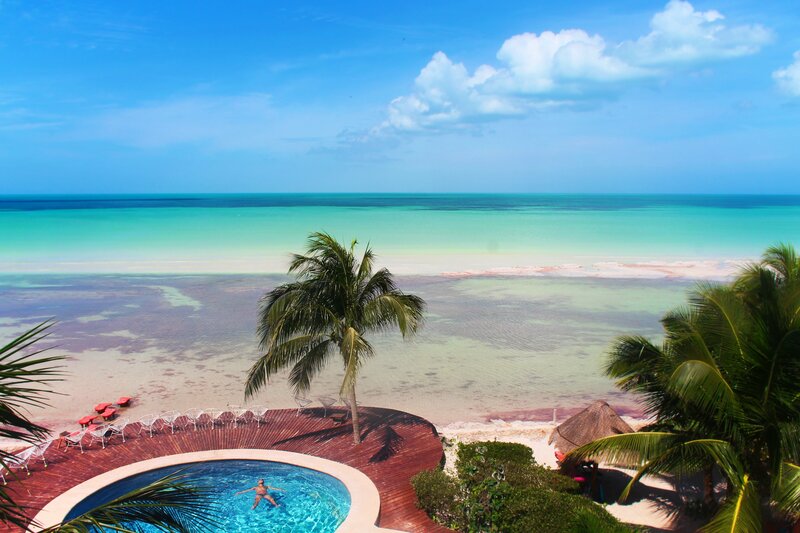 Many people who head to the Yucatan Peninsula are venturing to Cancun, but just south of Cancun are Tulum and Playa del Carmen, and to the north is Isla Holbox. You need to fly into Cancun (CUN) to start your trip to Playa del Carmen. You can also fly into Cozumel and then ferry over to Playa del Carmen, but that’s extra time and a lot of extra money (most likely, flights aren’t cheap). Playa can also be an add-on to the Yucatan trip you’ve already got planned. 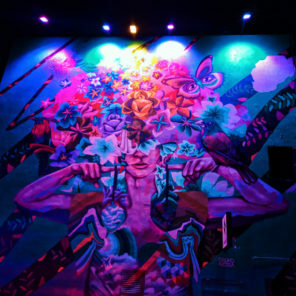 A great idea is to actually choose Playa del Carmen as a home-base for exploring all other areas. With great nightlife, colorful small towns nearby, natural wonders like cenotes and jungles within a short drive, it’s easy to head out for exploring the Yucatan in the daytime and be back for relaxation at night. 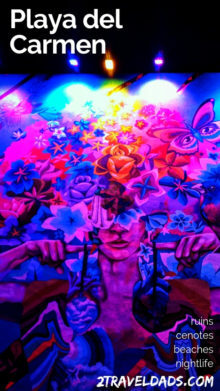 And so many wonderful restaurants in Playa del Carmen to enjoy! You can also visit Playa del Carmen as part of a Caribbean cruise. I came ashore in Playa while sailing on Royal Caribbean’s Oasis of the Seas. A lot of guests chose to stay on the island of Cozumel where we made port, but I jumped ship and took the forty minute ferry ride across to the Yucatan. I made a wise choice. 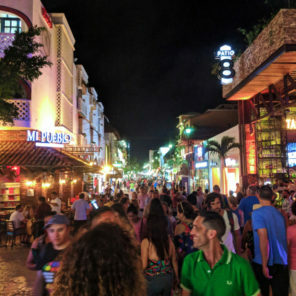 Note: if you are adding a trip to Playa del Carmen to a cruise, be sure that you are very wary of ferry times and the cruise ship’s scheduled departure. The cruise ships do NOT delay if they’re missing a few guests. 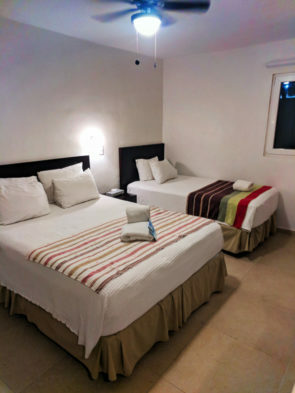 Something that makes Playa del Carmen really unique are the types of accommodations available. There are, of course, big hotels in the city that you can book, but then there are also a good number of smaller boutique hotels and inns. You can have a totally low key trip to Playa del Carmen by booking one of these. My favorite for a few reasons is the Club Yebo Hotel. It’s just off the main drag, two blocks to the beach, it’s quiet, clean and comfortable. I had a kitchenette and private balcony with a hammock all to myself. Bonus in my room, a cooler and beach supplies ready for a day of exploring. 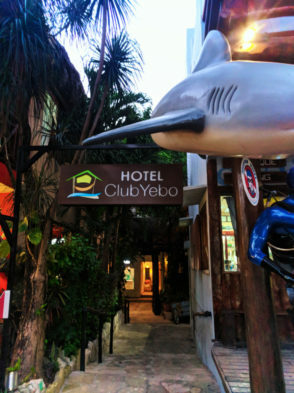 Club Yebo also has a very nice swimming pool and shaded courtyard perfect for hanging out. The staff was also really friendly and had lots of recommendations for dining and activities both in town and around the Yucatan. Every destination is more than its beach. San Diego is missions and amazing food. The Oregon Coast is lighthouses and hiking. 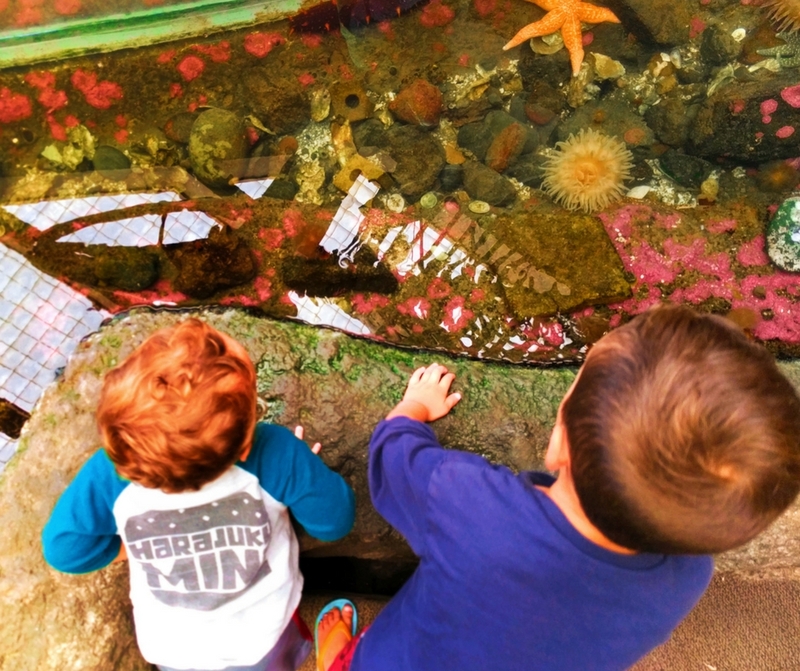 The Puget Sound is wine country mixed with small towns and nature… and a trip to Playa del Carmen is the beach with ruins and astounding nature. Until you’ve been swimming along and then realized that you’ve got a sea turtle stalker following you, you haven’t lived. After a short drive to the south out of Playa del Carmen you arrive at Akumal, or Turtle Cove. It is beautiful on its own with wonderfully fine sand and perfect small reefs just off the shore, but then add the congregation of sea turtles and it becomes an unreal destination. Also, early in the day the beach itself isn’t that crowded. 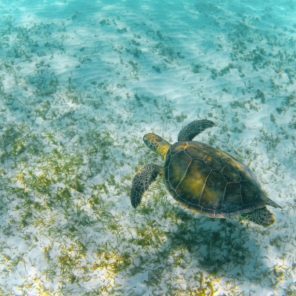 The cove at Akumal is one of a kind, and as of late, the government has become very active at protecting the turtles who come here to feed and make nests. On busier days, swimming in the turtle feeding areas will close to protect them from humans. While people typically aren’t touching the turtles and injuring them, sometimes people don’t give turtles enough respect and space. We’ve swam with sea turtles in Akumal each time we’ve done a trip to Playa del Carmen. One time, independently via a rental car and our own snorkeling gear, and one time with a tour company. Our guide with Cancun Adventures made sure to really drive home the safety talk and be sure that we are being responsible swimmers. She told us about distance, respect and our own safety, which I really appreciated as a very vocal advocate of ecotours and leaving no trace. 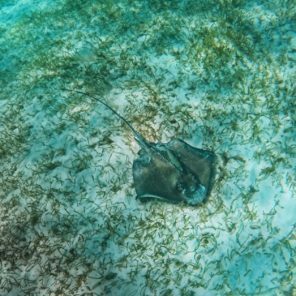 The opportunity to swim with such beautiful, incredible wildlife is something you can’t miss on a trip to Playa del Carmen. Whether you choose to book a tour to spend a day in Akumal or you drive there on your own, it’s a very good addition to time on the Yucatan. Perfect excursion out of Playa del Carmen. Tip: always bring an underwater camera, such as an Underwater Nikon, for some amazing pictures, but remember also to just enjoy seeing these amazing creatures in person. Step back from your lens for a short time and stop snapping pics to be in the moment. There are other cenotes that are much more grand and fascinating to visit than Cenotes Dos Ojos (and I’ve now researched and seen them), but swimming through the caves at Cenotes Dos Ojos is a really impressive experience and ideal for somebody who’s either a bit shy to cave snorkeling or short of time. 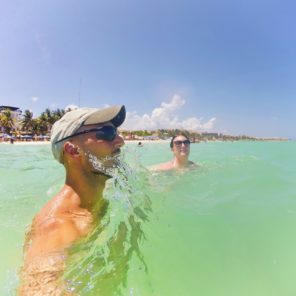 Located between Tulum and Playa del Carmen, it is an easy activity to add to a trip to Playa del Carmen and totally worth leaving the beach for. A cenote, if you’re unfamiliar, is a cave or sinkhole in the earth, with fresh water flowing through. 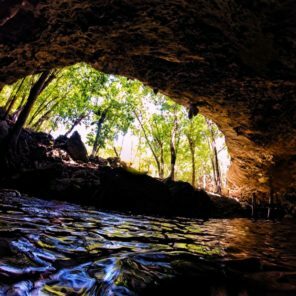 The Cenotes Dos Ojos are two different ones that are equally beautiful. From tropical tree roots growing in pillars down to the water, to bats flying over head while you swim around the stalactites and stalagmites in the water, it’s an otherworldly experience and not to be missed. Oh, and the water was so shockingly clear that looking down through it was like looking through a thin piece of glass. Fun fact: when you’re looking into water as clear as in the cenotes the depth is extremely deceiving and where it looks like it’s 10 feet deep, it’s probably 30 feet or more. Crazy. Note: this isn’t a super kid-friendly activity due to the underwater rock features, but every kid is different and if you check with a tour guide or the site managers at the cenotes, they may allow kids of a certain age and swimming skill level. The Yucatan Peninsula is loaded with ancient Mayan ruins. I think it may actually be impossible to take a trip to Playa del Carmen without seeing ruins. 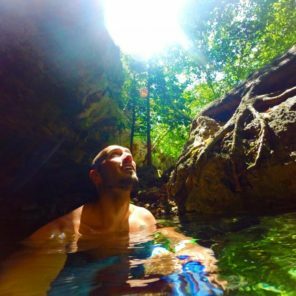 There are several great options for exploring the ancient communities, and depending on how much time you have and what sort of transportation you have, you’ll be able to visit at least one really amazing site out of Playa. 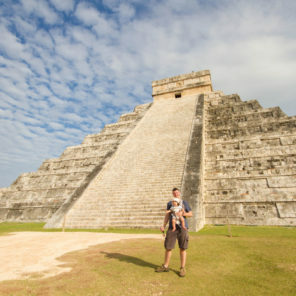 Chichen Itza is one of the most famous Mayan ruin sites, and there are lots of tours to get you there. It is nearly two hours from Playa del Carmen, but if it’s on your bucket list, make it happen. 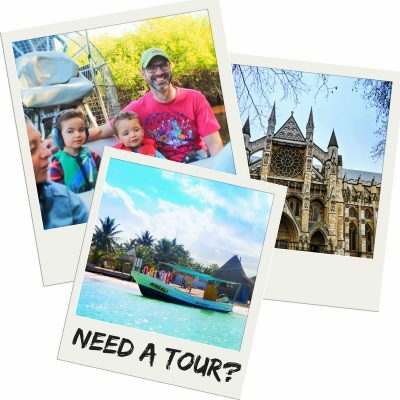 If you’re visiting with kids, check out the Wandering Wagars for their thoughts on exploring the ruins of the Yucatan and kid-friendly Chichen Itza. If you opt for Tulum you’ll be close to the beach and can cool off after you explore the ruins for a bit. 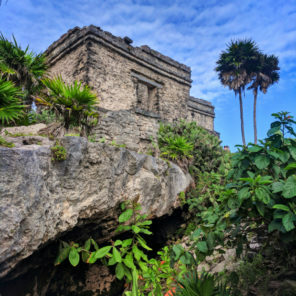 The Tulum National Park area is enormous with a wide variety of ruins. The setting is what makes it so special though, as a good number of the ruins are on the cliffs just above the turquoise Caribbean water. Mid-day, Tulum can be crowded, but still impressive. Our top pick for a Mayan ruins trip from Playa del Carmen is Coba. Also a national park, Coba is in a thick jungle and is just where you might expect to find Indiana Jones. 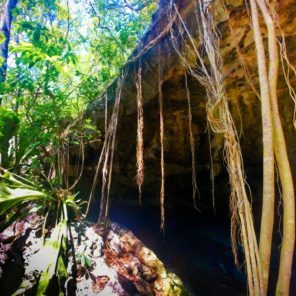 Immersed in ancient Mayan history, a day at Coba will take you through tunnels, on bikes, and even to the top of an ancient pyramid. 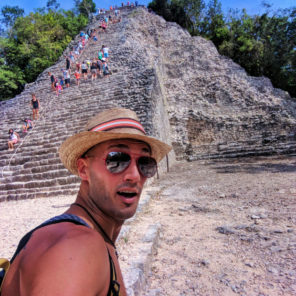 This is my favorite Mayan site, so check out the full article on how to visit Coba ruins. You cannot, I repeat, cannot keep me from the beach. Finding our way to a beachfront, sand-floored restaurant (the Wah Wah), is the perfect way to enjoy your standard Mexican buffet. Carnitas and more varieties of salsa than you can shake a stick at, this is my personal favorite spot for beachfront dining. The waves at Playa del Carmen are ideal for swimming. Not too big but definitely active, the beach is good for nearly every level of swimmer. You do need to be aware of small boats though, as they sometimes pull up to the shore, but it’s not bad like some spots in Cabo San Lucas. 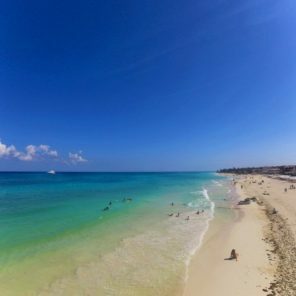 Directly around the main town area of Playa del Carmen, the beaches are very much just for swimming and relaxing. There aren’t a lot of rocks or reefs right there, so you’ll not need snorkeling gear. Tip: if you want a trip full of fish and underwater adventure, check out our guide to snorkeling in Cabo San Lucas. It’s a totally different tropical beach experience. 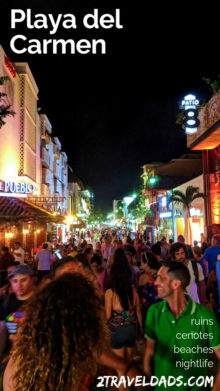 A trip to Playa del Carmen is a really great Caribbean plan that truly rivals our standard/favorite of Cabo San Lucas. The availability of nature and unique experiences make it special among Mexican destinations. It’s more affordable than many resort towns as it’s a functioning city in addition to being a tourist spot. 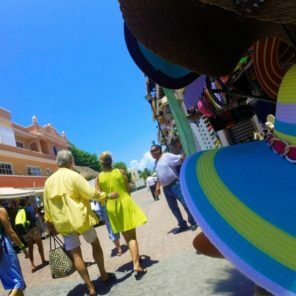 If you have any questions, let us know, because we’d love to share more of our experiences in Playa del Carmen. 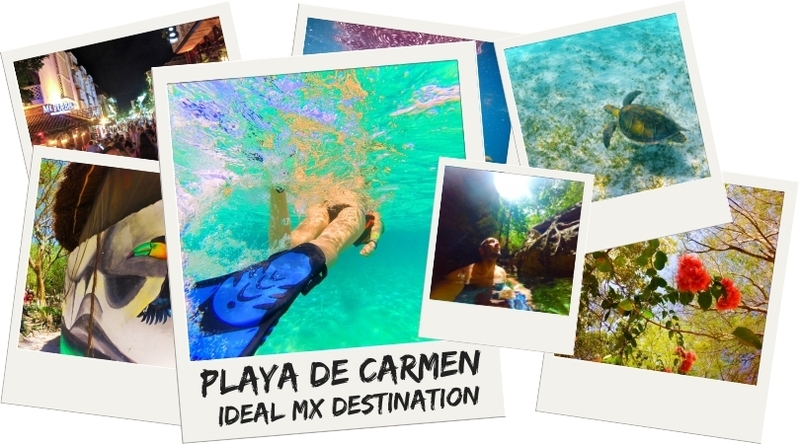 Want to pin this post for planning your own trip to Playa del Carmen? Go for it! 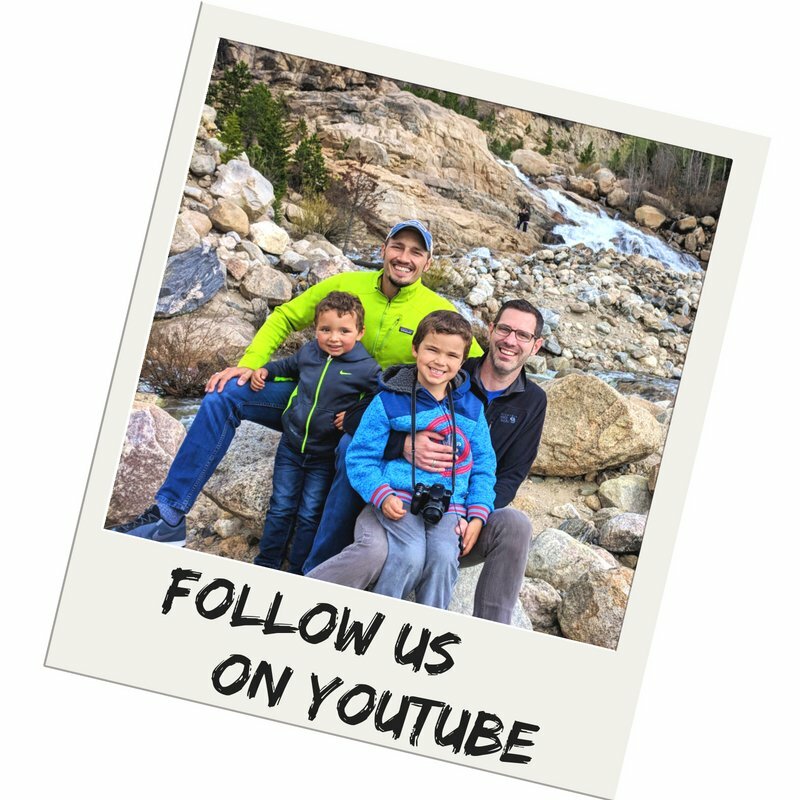 It sure sounds like a perfect destination for the family. 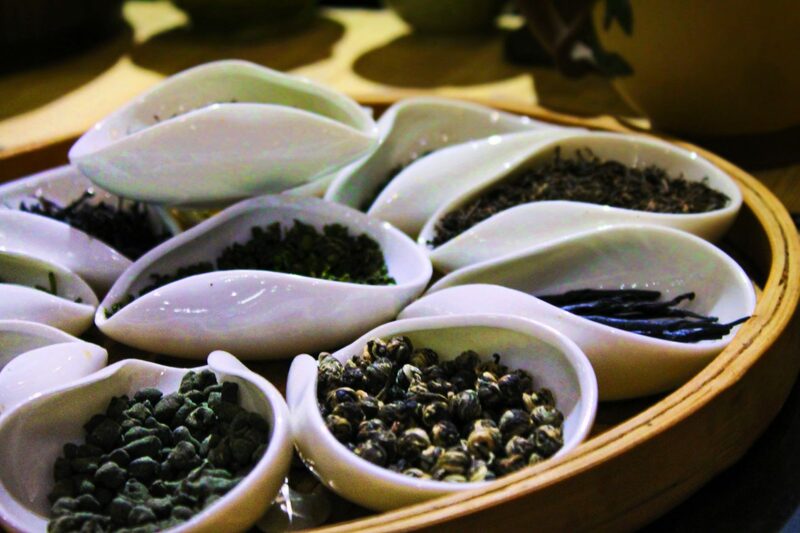 It packs in all the ingredients of a Caribbean holiday. I am sure you had a great time with the sea turtles, they look really cute.